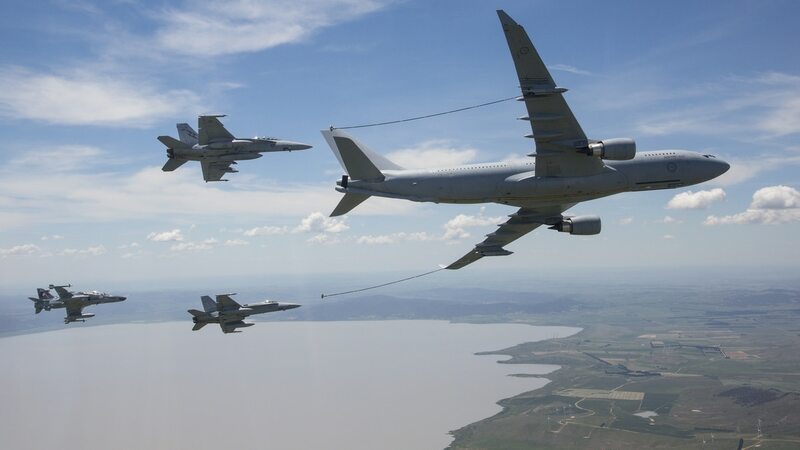 AVALON, Australia — The Royal Australian Air Force signed a research agreement with Airbus Defence and Space to develop an automatic air-to-air refueling capability for its KC-30A multirole tanker transport aircraft. Chief of Air Force Air Marshal Leo Davies signed the agreement with Airbus DS boss Fernando Alonso at the 2017 Australian International Airshow at Avalon on Thursday. The agreement will see an RAAF aircraft involved in the testing of the system, which has been under development by Airbus DS for some time. Davies also used the opportunity to announce that the Australian government had signed off on final operational capability for the KC-30A. "A lot of hard work has gone into the development of this capability, and we are now able to go into the next phase," he said. The project is a two-year program to develop an automatic refueling capability for the KC-30's aerial refueling boom system and is one of four strategies in Airbus DS's program for a smarter multirole tanker designed to increase the capability of the aircraft without major modifications. "The automatic air-to-air refueling system is easily retrofitted to our existing aircraft, involving minor hardware changes and upgrades to software," Davies said. The hardware changes will include the addition of a vertically mounted camera under the aft fuselage of the KC-30A to assist in triangulation and enhance depth perception of the computer-controlled system. The work will most likely involve the occasional use of one of the RAAF's five KC-30As and is expected to last about two years before the capability is ready for service. Development of the multirole tanker transport as a command and control node. Big data, which involves the expansion of the A330’s central maintenance computer to include mission equipment, in an effort to provide data for the development of a predictive maintenance program. A "SpaceDataHighway," which will improve the communications capabilities of the aircraft, including wideband satellite communications. "We would not be where we are today on the program without the men and women of the Royal Australian Air Force," Alonso said. "The aircraft is proven, it works, we've sold it and now it's time to move forward."